Whiter teeth are something we all aspire to have, wether it's a vanity thing or something to help build self confidence. And although I have brushed religiously since being a child, I've never been blessed with the pearliest of whites. Some of us are just born with slightly darker teeth, some are stained from excessive tea or wine drinking and some haven't had the best TLC they could have had. Other than brushing twice daily and taking general care of our teeth, there are a few other things we can do to help whiten our smiles. Use Whitening Products: Brushing well is all good, but if you want whiter teeth, make sure you'e using products targeted at making the teeth whiter. Whitening toothpastes are no more expensive than regular pastes, but they do that little bit extra to help on your journey towards the perfect smile and it doesn't stop there... In your local chemist or supermarket you can easily pick up teeth whitening strips, gels, pens and mouthwashes, the options are pretty endless. Oil Pulling: This is a technique which I carry out once a week in the quest to brighten my smile... It's not the most pleasant job in the world, but it is quite effective at cleaning the teeth, which definitely helps to make them appear whiter. 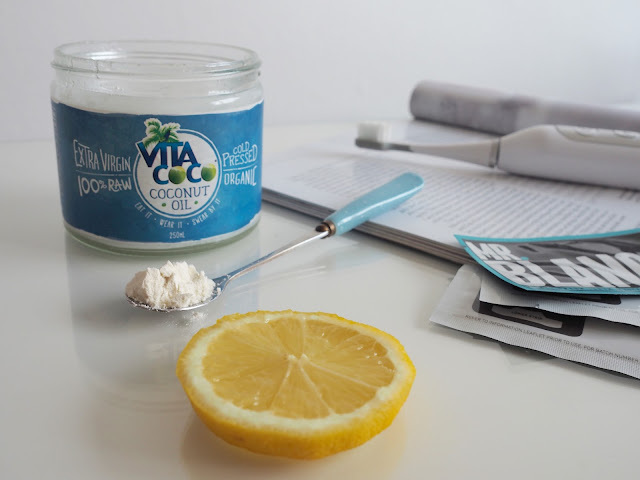 I use a small amount of coconut oil and swish it around my mouth and through the gaps between my teeth for around 60 seconds... This helps to dislodge any food or dirt from between my teeth and leaves my mouth feeling incredibly clean and fresh. Brush With Baking Soda: Although this isn't necessarily good for your teeth, when done in moderation and rinsed thoroughly it can really make a difference. By simply mixing with a few tablespoons of lemon juice or water you can make a paste to brush onto your teeth (it's not as gross as it sounds), then leave on the teeth for a minute or two before rinsing with water and/or mouthwash. Baking Soda is a mild abrasive, so by brushing onto the teeth it works away stains left by tea, coffee, red wine, cigarettes etc. Eat More Strawberries: No I'm not joking, strawberries can help to promote whiteness on your teeth - perfect excuse to indulge, just leave out the sugar. Ripe strawberries contain a high concentration of malic acid which gives a gentle and natural whitening effect to the surface of your teeth... You can choose whether to mash the strawberry and brush the teeth with it or simply rub the strawberry directly onto your teeth. This will work slowly and subtly, just remember not to do it too often as the citric acid in the strawberries can also weaken the surface of your teeth so stick to the ripe ones. Professional Whitening: Of course if you're really paranoid or down about your teeth and the above methods aren't quick enough or drastic enough for what you want, you can turn to the professionals. Treatments are painless, with only some people left with slight temporary sensitivity, results can be almost instant and can also be permanent if you look after them properly. There are clinics and dentists all around the country like the Centre for Advanced Dentistry Yorkshire where you can book consultations to talk through your needs and requirements before making any commitment. As long as you see a professional who really knows what they're doing, you and your teeth will be in safe hands. Do you have any tips for keeping your teeth white? Coconut oil is the most used thing in my beauty routine, it's amazing! !